Of the enrolled subjects, 10 had history of arthralgia especially knee joint (ANA negative), 10 had a history of hypertension, and 6 gave history of smoking. Lipid profile was abnormal in 16 subjects, 10 of them with neuropathy. Two subjects had both hypertriglyceridemia and low high-density lipoprotein (HDL) cholesterol values and the rest had only low HDL abnormality. It was also observed family history of DM was present in 28 (48.3%) subjects, 12 of them had neuropathy. Of the 58 subjects, 56 (96.6%) subjects had body mass index (BMI) <30. All subjects were followed for 4 years and 20 (34.5%) subjects developed DM and needed treatment [Table 1]. 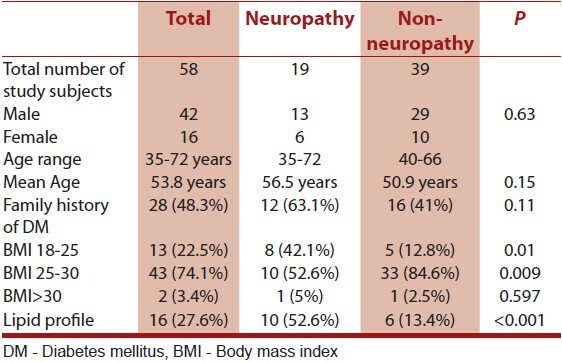 Of rhw 58 subjects with IGT, 19 (38.2%) had neuropathy. 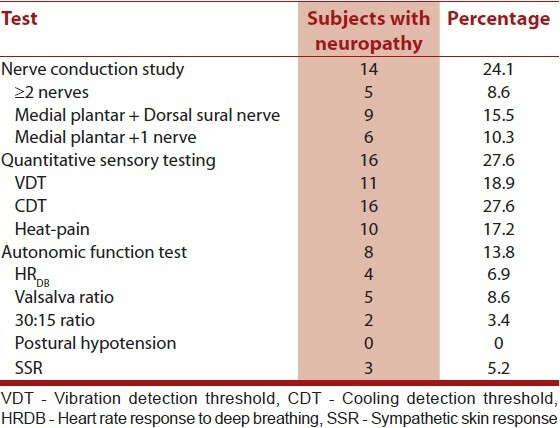 Nerve condiction studies showed evidence of neuropathy in 14 (24.1%), 5 (8.6%) had NCS abnormalities in ≥2 nerves, 9 (15.5%) had medial plantar and dorsal sural nerve involvement, and 6 (10.3%) had NCS abnormalities in one nerve combined with medial plantar or dorsal sural nerve [Table 2]. There was no correlation between NCS/QST/AFT abnormalities using Pearsons correlation coefficient method [Figure 1]a-c.
Martin CL, Albers J, Herman WH, Cleary P, Waberski B, Greene DA, et al. DCCT/EDIC Research Group. Neuropathy among the diabetes control and complications trial cohort 8 Years after trial completion. Diabetes Care 2006;29:340-4. Boulton AJ, Malik RA. Neuropathy of impaired glucose tolerance and its measurement. Diabetes Care 2010;33:207-9. Sumner CJ, Sheth S, Griffin JW, Cornblath DR, Polydefkis M. The spectrum of neuropathy in diabetes and impaired glucose tolerance. Neurology 2003;60;108-11. Papanas N, Ziegler D. Prediabetic neuropathy: Does it exist? Curr Diab Rep 2012;12:376-83. World Health Organization. Definition and Diagnosis of Diabetes Mellitus and Intermediate Hyperglycemia: Report of WHO/IDF ConsultationGeneva, World Health Org., 2006. Available from: http://www.ncbi.nlm.nih.gov/pmc/articles/PMC3308281/[Last accessed on 2013 Jul 03]. Bastyr EJ 3 rd , Price KL, Bril V. MBBQ Study Group. Development and validity testing of the neuropathy total symptom score-6: Questionnaire for the study of sensory symptoms of diabetic peripheral neuropathy. Clin Ther 2005;27:1278-94. Dyck PJ, Carter RE, Litchy WJ. Modeling nerve conduction criteria for diagnosis of diabetic polyneuropathy. Muscle Nerve 2011;44:340-5. Isak B, Oflazoglu B, Tanridag T, Yitmen I, Us O. Evaluation of peripheral and autonomic neuropathy among patients with newly diagnosed impaired glucose tolerance. Diabetes Metab Res Rev 2008;24:563-9. Dyck PJ, O′Brien PC, Kosanke JL, Gillen DA, LPN, Karnes JL. A 4, 2, and 1 stepping algorithm for quick and accurate estimation of cutaneous sensation threshold. Neurology 1993;43:1508-12. Dyck PJ, O′Brien PC, Johnson DM, Klein CJ, Dyck PJ. Quantitative sensation testing. In: Dyck PJ, Thomas PK, editors. Peripherial Neuropathy. Vol 1. 4 th ed. Philadelphia: Elsevier Saunders; 2005. p. 1063-93. Singleton JR, Smith GA, Bromberg MB. Increased prevalence of impaired glucose tolerance in patients with painful sensory neuropathy. Diabetes Care 2001;24:1448-53. Mohan V, Deepa M, Anjana RM, Lanthorn H, Deepa R. Incidence of diabetes and pre-diabetes in a selected urban south indian population (Cups-19). J Assoc Physicians India 2008;56:152-7. Anjana RM, Pradeepa R, Deepa M, Datta M, Sudha V, Unnikrishnan R, et al. ICMR-INDIAB Collaborative Study Group. Prevalence of diabetes and prediabetes (impaired fasting glucose and/or impaired glucose tolerance) in urban and rural India: Phase I results of the Indian Council of Medical Research-INdia DIABetes (ICMR-INDIAB) study. Diabetologia 2011;54:3022-7. Smith AG, Russel J, Feldman EL, Goldstein J, Peltier A, Smith S, et al. Lifestyle intervention for pre-diabetic neuropathy. Diabetes Care 2006;29:1294-9. Sahin M, Karatas M, Sahin M, Ertugrul D, Kulaksizoðlu M, Dogruk A, et al . High prevalence of neuropathy in patients with impaired 60-minute oral glucose tolerance test but normal fasting and 120-minute glucose levels. Minerva Endocrinol 2008;33:289-96. Dyck PJ, Dyck PJ, Klein CJ, Weigand SD. Does impaired glucose metabolism cause polyneuropathy? Review of previous studies and design of a prospective controlled population-based study. Muscle Nerve 2007;36:536-41. Dyck PJ, Clark VM, Overland CJ, Davies JL, Pach JM, Dyck PJ, et al. Impaired glycemia and diabetic polyneuropathy: The OC IG Survey. Diabetes Care 2012;35:584-91. Im S, Kim SR, Park JH, Kim YS, Park GY. Assessment of the medial dorsal cutaneous, dorsal sural, and medial plantar nerves in impaired glucose tolerance and diabetic patients with normal sural and superficial peroneal nerve responses. Diabetes Care 2012;35:834-9. Uluc K, Isak B, Borucu D, Temucin CM, Cetinkaya Y, Koytak PK, et al. Medial plantar and dorsal sural nerve conduction studies increase the sensitivity in the detection of neuropathy in diabetic patients. Clin Neurophysiol 2008;119:880-5. 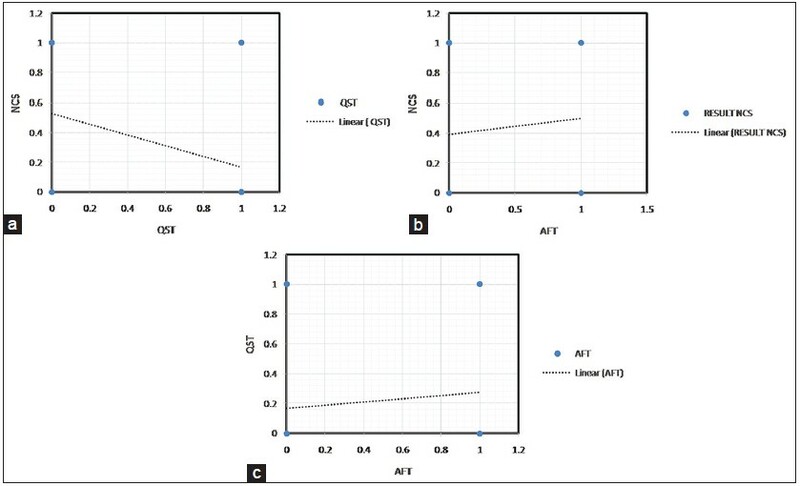 Green AQ, Krishnan S, Finucane FM, Rayman G. Altered C-fiber function as an indicator of early peripheral neuropathy in individuals with impaired glucose tolerance. Diabetes Care 2010;33:174-6. Zilliox L, Peltier AC, Wren PA, Anderson A, Smith AG, Singleton JR, et al. Assessing autonomic dysfunction in early diabetic neuropathy: The Survey of Autonomic Symptoms. Neurology 2011;76:1099-105. Siao P, Cros DP. Quantitative sensory testing. Phys Med Rehabil Clin N Am 2003;14:261-86. Peltier A, Smith AG, Russell JW, Sheikh K, Bixby B, Howard J, et al. Reliability of quantitative sudomotor axon reflex testing and quantitative sensory testing in neuropathy of impaired glucose regulation. Muscle Nerve 2009;39:529-35. Rajabally YA. Neuropathy and impaired glucose tolerance: An updated review of the evidence. Acta Neurol Scand 2011;124:1-8. Pittenger GL, Mehrabyan A, Simmons K, Amandarice, Dublin C, Barlow P, et al. Small fiber neuropathy is associated with the metabolic syndrome. Metab Syndr Relat Disord 2005;3:113-21. Kuroda N, Taniguchi H, Baba S, Yamamoto M. Cardiovascular and pupillary light reflexes in subjects with abnormal glucose tolerance. Diabetes Res Clin Pract 1989;7:213-8. Vaag A, Lund SS. Non-obese patients with type 2 diabetes and prediabetic subjects: Distinct phenotypes requiring special diabetes treatment and (or) prevention? Appl Physiol Nutr Metab 2007;32:912-20. Wagner R, Thorand B, Osterhoff MA, Müller G, Böhm A, Meisinger C, et al. Family history of diabetes is associated with higher risk for prediabetes: A multicentre analysis from the German Center for Diabetes Research. Diabetologia 2013;56:2176-80. Smith AG, Singleton JR. Obesity and hyperlipidemia are risk factors for early diabetic neuropathy. J Diabetes Complications 2013;27:436-42.